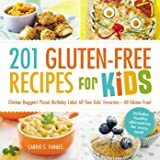 Captain Katie: The Pirate Allergic to Gluten is a book about a pirate who declares war on gluten after discovering she has a disease called celiac. 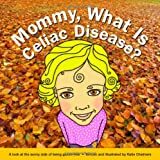 This book gives a simple introduction to what celiac means and encourages people to get along with each other despite their dietary differences. It contains tips for pronouncing and understanding larger words and a complete translation of the story in Esperanto. Kapitano Katarino: La Pirato Alergia je Gluteno estas libro pri fifama pirato, kiu deklaras militegon kontraŭ la gluteno post malkovro, ke ŝi havas la malsanon celiakio. Ĉi tiu libro enkondukas la legantojn al la senglutena vivo kaj kuraĝigas, ke ili harmonie vivu kun ĉiuj malgraŭ dietaj diferencoj. Ĝi enhavas kaj anglan kaj Esperantan versiojn de la rakonto. 5.0 out of 5 starsAhoy, Matey! Captain Katie is one fun book! As a beginner in Esperanto, and someone who suffers from gluten intolerance, this cute little story of Captain Katie was a welcome read. The story was entertaining and gave me some good practice reading aloud in Esperanto - which was even more fun due to the fact that the story is written in rhyme. The book has an entire English version as the first half of the book...so no worries if you only read English. The second half of the book is the story again in Esperanto! A colorful, fun book that can help promote awareness of food allergies/ sensitivities in general. I suggest buying an extra copy and donating it to your local school library! 5.0 out of 5 starsKapitano Katarino Konkeros vian Koron! sed kontraŭ la tritiko strikas. Se vi deziras lerni pli pri tiu unika Kapitano Katarino, kaj eltrovi la kialon por ŝia antipatio al tritiko, aĉetu tiun ĉi ĉarman libron. Vi legos rakonton pri grava sanproblemo, kiu kaŭzas koleran reagon; pri konflikto, risko, subita interkompreno, kaj fine, feliĉo. Ĉiuj indaj temoj por prezenti al viaj infanoj aŭ genepoj. La verkisto verkas per rimo kaj ritmo en la angla kaj en Esperanto. La desegnaĵoj perfekte harmonias kun la teksto. Alex Vaughn Miller aldonas plaĉan, mallongan libron al la malvasta kolekto de trafaj dulingvaj libretoj por infanoj. I bought this book and its sequel (Captain Katie and the Malt of Doom) as gifts for a young relative. 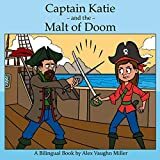 Captain Katie is an excellent way to introduce children to the idea that not everyone can eat the same things, and the Esperanto can help spur a conversation about language even if you don't speak it. 5.0 out of 5 starsTre lerta kaj amuza rakonto, ege bone verkita! I bought this book for my daughter, who knows a little Esperanto and is interested in languages. I especially like that the book is in both English and Esperanto - a young, curious mind would immediately be drawn towards comparing the text (and thereby learning). Esperanto is an excellent tool for introducing children to languages in general (the same way that the recorder is a useful instrument to use when introducing children to music) so that they learn about how languages work via a language that is very easy to master, and her introduction to Esperanto is already helping her out with Japanese. I'm especially delighted with the rhymes in this book, which are clever and fun both in English and Esperanto (no mean feat), and make reading either text aloud to or with children a lot of fun, and I'm looking forward to sharing this book with her! 5.0 out of 5 starsCaptain Katie was a hit with the grandkids! Got this book to read to my grandchildren. They loved it! Their mother (who just happens to be named Katie) has a gluten sensitivity so it was particularly applicable. 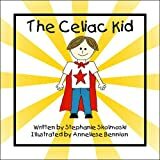 I think all children ought to know about celiac and gluten. The rhyming scheme makes it easy to read. The illustrations are realistic and brightly colored. Highly recommend! I’d enjoy more books by this children's author. A refreshingly original children's story focusing on a unique subject that more and more kids of today are finding themselves in. The rhyming throughout this book is very witty and has laugh-out-loud moments. Overall the story is very entertaining and also educational. 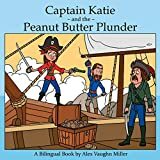 Children and parents alike will enjoy and appreciate the fun learning adventure of the pirate Captain Katie. Hope there's more adventures to come! 5.0 out of 5 starsFun, informative and with Esperanto in it for good measure! 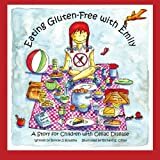 This book is not only amusing and well-written, but also quite useful to parents struggling with how to best explain to a child with a gluten allergy about his or her condition in a way that is fun as well as informative. The fact that it also has a translation into the international language of Esperanto is frankly a delightful surprise, which probably makes it unique among children's books.